If your cleanup involves common, everyday waste, chances are you can put it in a dumpster. But the specifics depend on what type of service you’re talking about. There are different rules on what can go in a roll off dumpster— rented for one-time projects like a remodel—than for commercial dumpsters for regular trash collection at a business. Check our lists for guidelines on both types of containers. And if you’re still not sure, give us a quick call to find out if your particular items can be thrown in a dumpster. What Can You Put in a Roll Off Dumpster? You can throw most types of household junk, construction and remodeling debris in a roll off dumpster. However, there are often rules about what debris types can be mixed in the same container. This is typically due to trash and recycling regulations: certain items may need to be sent to a separate landfill, transfer station or recycling facility. This table shows you what materials are typically allowed and what type of roll off dumpster you should rent to haul them away. Household Junk Residential Dumpster Furniture, appliances and electronics may not be accepted in all locations. 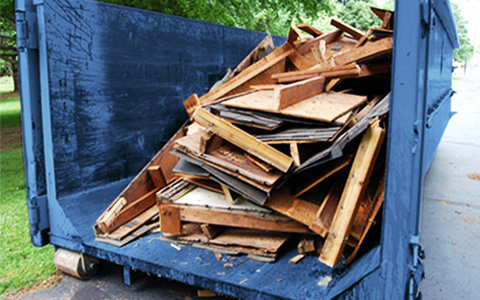 Remodeling Debris Construction Dumpster This includes items like cabinets, counters, flooring, drywall, wood etc. Yard Waste Yard Waste Dumpster Stumps and dirt may not be accepted in all locations. Shingles Roofing Dumpster Other roofing debris like flashing and underlayment are also accepted. Concrete, Asphalt & Brick Heavy Debris Dumpster Other types of heavy debris may be accepted in certain locations. While you can toss most common items in a roll off dumpster rental, a few restrictions apply. Usually this is because a certain item must be handled separately from other debris, using special processes and equipment, for environmental or safety reasons. This table shows items typically not allowed in a dumpster and where you should get rid of them instead. Fuels, Oils, Batteries, Paints & Lacquers Flammable and/or toxic to the environment. Local household hazardous waste facility. Asbestos & Medical Waste Harmful to human health. Asbestos abatement company or medical waste service. Industrial Drums & Contaminated Absorbents Toxic to the environment. Local hazardous waste collection service. Food Waste, Inks, Resins, Adhesives Can attract vermin or damage the inside of the dumpster. Household trash or local recycling facility. Refrigerators, Air Conditioners & Hot Water Tanks Contain toxic chemicals or collect harmful gases in landfills. Take back programs at your utility company, scrap yards or refrigerant recovery services. Tires & Railroad Ties Damage landfill infrastructure or contain toxic chemicals. Local tire recycler or auto shop. Railroad ties can be reused. While the information in the tables above are true nearly everywhere, some materials are wild cards. Many cities and counties have their own rules on whether these items can go in a dumpster based on what types of landfills are found in the area, local recycling capabilities and regional environmental regulations. If you need tips for getting rid of these items, check out our Disposal Guides or give us a call. Can Furniture Go in a Dumpster? You can throw furniture in a dumpster in most locations. However, some areas will only allow non-upholstered items. Can You Throw a TV in a Dumpster? In many areas, CRT televisions (old-style bulky sets) aren’t accepted even if flat screens are. Instead, look for an e-waste recycler. Can You Put Dirt in a Dumpster? Dirt is allowed in many areas, but typically can’t be mixed with any other debris. When it’s not allowed in a dumpster, consider selling your soil. Can You Toss Electronics in a Dumpster? Electronics are often not allowed in dumpsters due to local laws banning e-waste from landfills. Instead, find a nearby recycling facility. Can You Put Mattresses in a Dumpster? Mattresses are typically accepted but may require an additional fee to cover breaking them down. Mattress recyclers are another option. Can You Throw Appliances in a Dumpster? Appliances are usually allowed in a dumpster but there may be restrictions on how many can go in the container or extra fees to cover special handling. What Is and Isn’t Allowed in a Commercial Dumpster? What Can You Put in a Commercial Dumpster? You can put most types of common trash, office supplies and shipping materials in your commercial dumpster. When you set up your service, make sure to choose a bin size and trash collection schedule that will keep your container from filling up before your next pickup. This table shows what’s allowed in your dumpster and any notes you should be aware of. General Trash All types of everyday waste are accepted in our front load dumpsters. Aerosol Cans Empty the cans before you toss them in your bin. Food Waste Make sure food waste is bagged up, not loose, to discourage pests. Packaging Materials Break down boxes or other bulky materials to save space in your container. Office Supplies & Electronics Electronics may not be accepted in all areas due to local dumpster restrictions. What Is Not Allowed in a Commercial Dumpster? While your commercial bin is the right place for most of the trash your business produces, some restrictions do apply. Hazardous items aren’t allowed in dumpsters for safety reasons and certain bulky items are too big to be collected by normal garbage trucks or need to be transported to a different landfill than everyday trash. This table shows the items that typically can’t go in a commercial dumpster and how you should get rid of them instead. Fuels, Oils & Batteries Contact a hazardous waste disposal service. Industrial Drums & Liquid Chemicals Contact a drum disposal or chemical collection service. Medical Waste Contact a medical waste collection service. Tires Find a local tire recycler. Appliances Rent a temporary roll off dumpster. Construction, Remodeling & Roofing Materials Rent a temporary roll off dumpster. Concrete, Brick, Dirt & Asphalt Rent a temporary roll off dumpster. Why Is It Important to Follow the Rules? It’s easy to take an “out of sight, out of mind” attitude towards your trash. But ignoring these dumpster rules can have an impact on your wallet. If you toss prohibited items in your bin, the landfill will charge you extra to cover the expense of safely handling those materials or transferring them to the proper facility. So, keep these lists handy. By following the rules on what is and isn’t allowed in your dumpster, you’ll avoid extra expenses and keep your service rolling without interruptions. Still Have Questions? Ask Us About the Rules in Your Area.